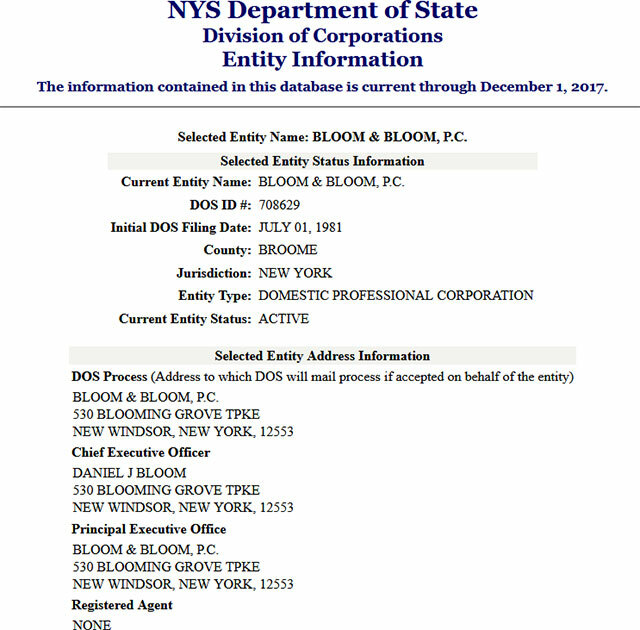 If you are looking for business entities registered with the Secretary of State of New York, you have come to the right place. 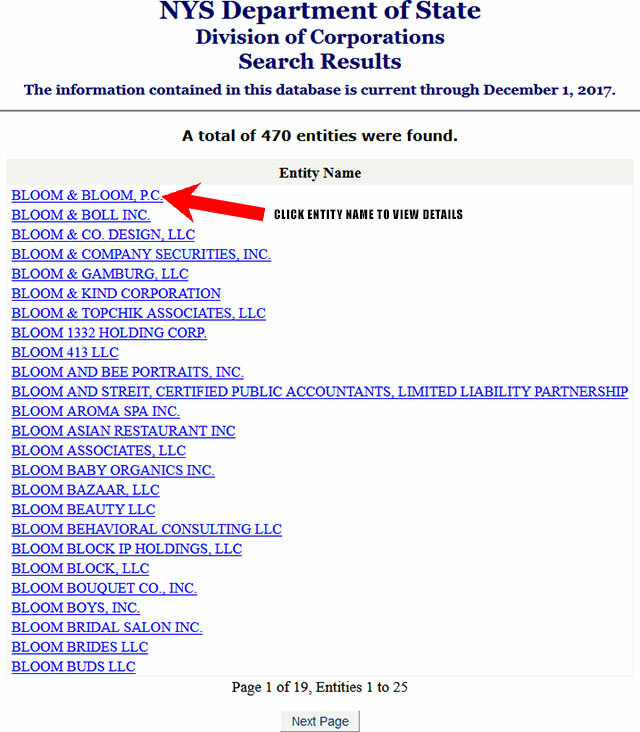 An online search tool provided by the Secretary of State of New York helps you find any business entity that is headquartered in the state. 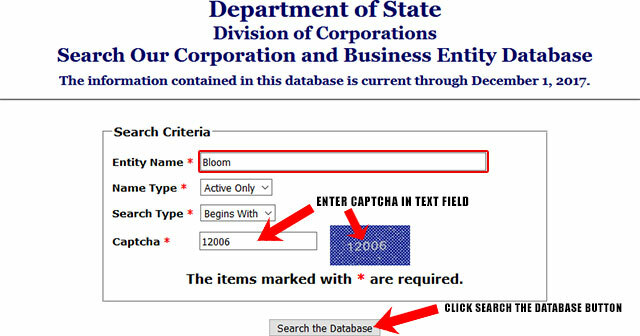 Below is a step by step guide on how to use the New York business search tool. 1. The first step is to access the New York business search page by clicking here. The page looks something like the screenshot below. 2. The business search form allows you to search by name, name type and search type. You also need to enter the captcha code, which verifies that a human is using the form. For this example we will be searching by business name. Enter the name "Bloom" in the "Entity Name" text field. Then enter the captcha code shown in the text field. Once done leave the remaining fields at their default values and click the "Search the Database" button as shown in the screenshot below. 3. Once you click the "Search the Database" button, the results page will display all business entities that match your search criteria. The page looks similar to the screenshot below. 4. 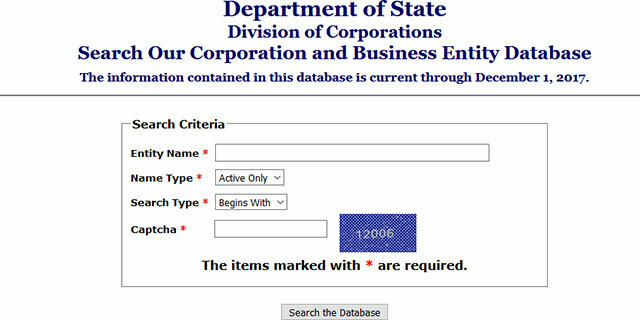 Click on the name of the business entity to access more details like filing date, jurisdiction, address, etc. It will look something like the screenshot below. Aside from filing annual reports, you can also order a Certificate of Good Standing for a New York business entity online. The Secretary of State of New York is one of the cabinet officers in the state of New York. The Department of State of New York elects the Secretary of State after every four years. The current Secretary of State of New York is Rossana Rosado, a Democrat. She has been serving in the position since February 2016. 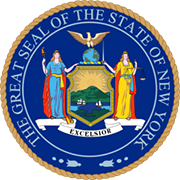 The Secretary of State of New York is the custodian to the Great Seal of the State. She is authorized to attest any governmental documents using the seal. The New York Secretary of State is also in charge of regulating certain laws and protocols in the state like election rules, regulating incorporation's, and issuing protocols for vehicles and others.